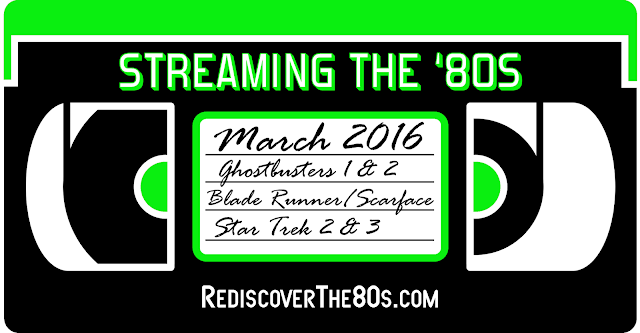 Streaming the '80s is your monthly source for the latest '80s titles available on Netflix and Amazon Prime. Not a member of these streaming services? Start your 30-Day free trial now by clicking through the two previous links. Tomorrow is the big day when we'll get to see the first full-length trailer for the new Ghostbusters movie. The teaser announcement didn't give us much other than the classic "who you gonna call?" tagline. After intially being wary of the reboot, my attitude changed once I learned more about everything that will be in the film like the equipment, cameo roles, and a new Ecto-1. If you still aren't convinced, the 8 reasons why I am excited might give you a different perspective. Also coming this month to Netflix is Pee-Wee's Big Holiday on March 18 and season 2 of the new Popples animated series. Let's take a looking now at what's available now! Click the links to add to your Netflix or Amazon Prime queue. Ghosts invade New York and force a trio of spirit exterminators to save the city in one of the biggest comedies of all time. Bill Murray, Dan Aykroyd and Sigourney Weaver head the all-star cast. 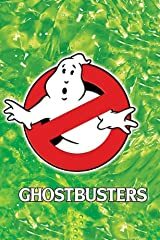 And speaking of Ghostbusters, the original and 1989 sequel are new to Amazon Prime this month. I will be rewatching them multiple times before I go see the reboot in July. 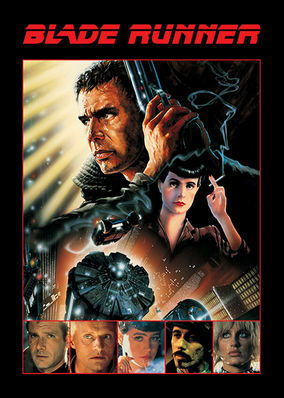 I've only ever watched Blade Runner once and it wasn't until just a couple years ago. I obvious not a huge fan, but I know the film has a huge cult following. Now is a great time for me to give it a 2nd chance, especially with a long-awaited sequel in the works. Al Pacino stars as Cuban refugee Tony Montana, who becomes a Florida drug kingpin but makes the fatal mistake of getting high on his own supply. 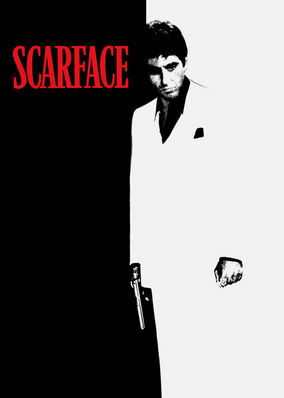 It's been awhile since I watched Scarface, although I'm reminded of it pretty much every day. There is an SUV along my route to work that is half black/half white with the above poster image on the hood. I can't say my affinity for the film is that great, but I might have to revisit in the near future. Kirk assists Spock in a training mission for Starfleet cadets. 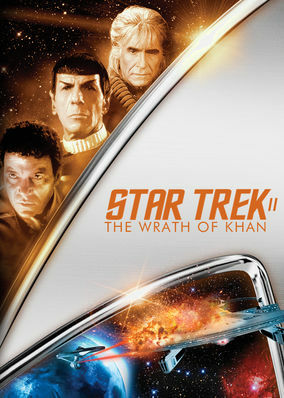 But the novice crew is put to the test when they must confront escaped villain Khan. I've always sided with Star Wars in the battle against Star Trek, but I have enjoyed most of the films and this one would rank near the top for me. Star Trek III: The Search For Spock has also been added to Netflix this month. In pursuit of new computer super chips, Bond uncovers a plan which could destroy Silicon Valley and the West's computer industries. 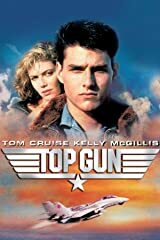 10 James Bond films have been added to Amazon Prime from Sean Connery to Pierce Brosnan. 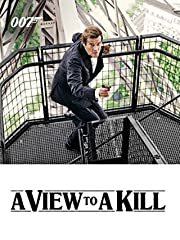 A View To A Kill was the one that started it all for me. I remember watching it on HBO at a friend's house as a kid and being enamored with the spy world. Of course, there are many better films in the Bond world, but I still enjoy this one which includes maybe my favorite theme song. 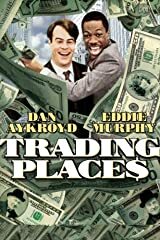 The fun begins when the rich and greedy Duke Brothers (Don Ameche and Ralph Bellamy) wager a bet over whether born loser Valentine (Eddie Murphy) could become as successful as the priggish Winthorpe (Dan Akroyd) if circumstances were reversed. I honestly can't remember the last time I've watched this movie. It's one I really need to revisit and plan to do so this month. With 2016 being the 30th anniversary, now is a great time to rediscover this classic '80s action/drama film. I still hear rumors about a sequel, but I kinda wish they would just leave it alone.